Well, here are some more recipes that I tried from fellow bloggers and absolutely loved. Thank you girls for such awesome recipes and for sharing it with us all. Nupur's Sabudhana Khichdi in the microwave which was just mind blowingly simple and tasted awesome. 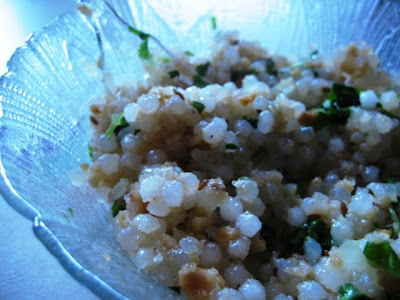 My search to make the perfect sabudhana khichdi just ended. I skipped the potatoes however and added onions instead. Nupur's Ragda Patties which made for an awesome spicy lunch especially because I spiced up the patties like I did for my aloo tikkis. Seema's Chaklis which turned out buttery and crisp. I gave some to the teachers at my daughter's daycare and they loved it too. Tofu in Garlic Sauce from Rajitha's blog where I substituted the Paneer with Tofu. Was great with some fried rice. We polished off the bowl in minutes. Oh! Sorry I forgot to include this one earlier.. totally forgot. 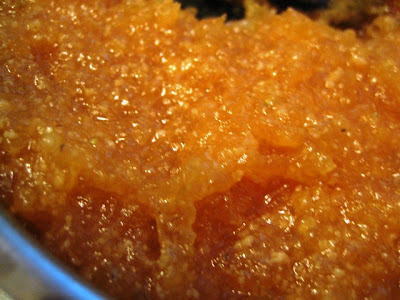 Kribha's Pumpkin Halwa which was awesome. My husband and daughter liked it a lot and it was gone in no time. Stuffed Peppers from Richa's blog. Unfortunately no pictures but I loved it. Must make it again. Update on 5th July 08 : Adding picture when I made it again recently. Just skipped the coconut though and used anaheim peppers. Nandita's Chocolate Brownies which were easy to whip up and tasted good. Sorry but no pictures again. Great Job Laav!! So many dishes u tried...Hats of to you. Everything looks delicious! I am in awe of that murukku...have never tried to make that at home. Really yummy looking stuff Laavanya! The ideas may have been from others, but your efforts really show! 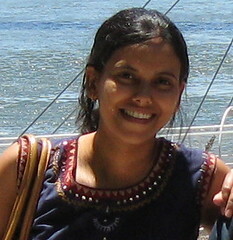 Nupur's sabudana khichdi is on my list too. I bought a pack(first time ever) over the weekend just to try it out. 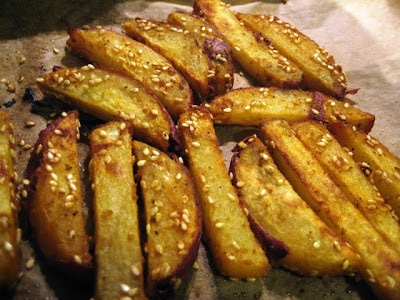 I too have tried out Nandita's potato wedges and brownies. They're the best! Wow that is what i call cooking. Thnks for trying out the dish laav..i know u told me about it..and i am so happy!! and those potatoes look mouthwatering..should try it out.. Awesome Laavanya.. All the dishes look yummy! even i'd also tried recipes from blogger fnds. what a wonderful selection of recipes!! Sure they must have tasted amazing!!! Wish I had 1/10th of your energy my dear!!!! woww!! thats a lot of recipes from other blogs...well..i guess thats one of the purposes of blogging :) good job gurl!! kudos to u L. I am so lazy that i hv no words to describe my laziness. But i am completely inspired looking at the glorious array of stuff u hv made. You have tried so many recipes from other bloggers. thats great. Great way to compliment. Thankyou soooooo much for trying out the halwa. I'm so thrilled that you liked it. I showed off your picture to my hubby too. Loved your other dishes also. Can't wait to try them. hey u wont beleive tha i have bookmarked tofu in garlic sauce, potato wedges and pumpkin halwa..
but could nt find time to do it... u did a great job by trying so many items.